OAKVILLE, ONTARIO--(Marketwired - June 14, 2017) - Saint Jean Carbon Inc. ("Saint Jean" or the "Company") (TSX VENTURE:SJL)(OTCQB:TORVF), a carbon science company engaged in the design and build of green energy storage, green energy creation and green re-creation through the use of carbon materials. 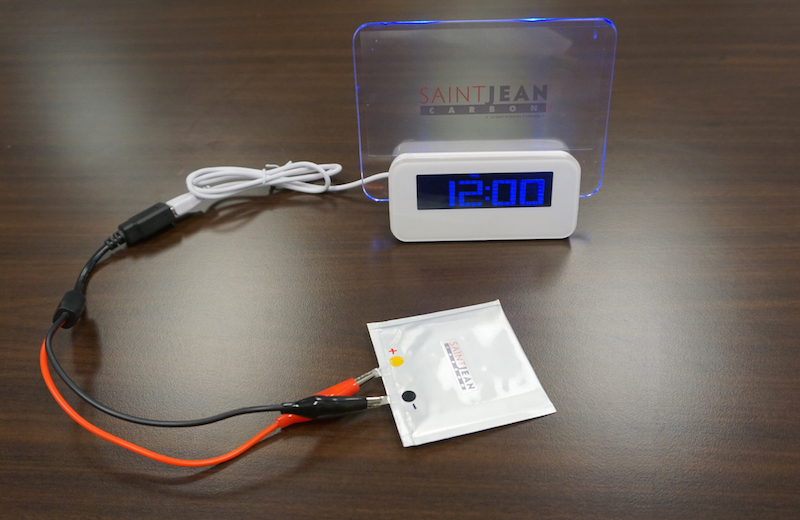 Saint Jean is pleased to announce the Company has completed a full cell graphene battery, as previously announced in a press release dated April 20th, 2017. The company is working on creating high performance graphene batteries through a series of research projects. The first step was to test the graphene against graphite as an anode material in a coin cell (half-cell). The tests show that the graphene outperformed the graphite by about 30% as demonstrated over 100 cycles the discharge capacity for the graphite was 200 to 220 mAh/g and for the graphene 310 to 330 mAh/g. The next step was to create a full pouch cell that would function in a real world application, as an example; a clock with a nightlight (follow the link to view the photograph of the battery). The battery takes about 4 to 5 minutes to fully charge and can keep functioning for about 25 minutes. With an operating window of 3.0-0 4.2 volts and capacity of 140mAh/g. The Company is very encouraged by the results and as such will complete the final series of tests. The Company will now design and construct a high performance graphene full cell. The graphene will be produced and modified to try and reach the theoretical performance threshold. The goal is to achieve double the performance of a graphite anode. The preparation of the cells and test were all managed by Graffana Inc of Waterloo Ontario. The raw material was source from a third party. Paul Ogilvie, CEO, commented: "We are very pleased to continue to push for opportunities for graphene in practical applications; as simple as a clock and light, next possibly a drill with the end goal of producing an electric car battery with a graphene anode. With the continued research it all helps move the goal a little closer to reality." The Company would also like to announce the completion of the drill program announced in press release dated January 12, 2017. The drill core has been sent to the lab for assaying. We look forward to publishing the results in the coming weeks. FORWARD-LOOKING STATEMENTS: This news release contains forward-looking statements, within the meaning of applicable securities legislation, concerning Saint Jean's business and affairs. In certain cases, forward-looking statements can be identified by the use of words such as "plans", "expects" or "does not expect", "intends" "budget", "scheduled", "estimates", "forecasts", "intends", "anticipates" or variations of such words and phrases or state that certain actions, events or results "may", "could", "would", "might" or "will be taken", "occur" or "be achieved". These forward-looking statements are based on current expectations, and are naturally subject to uncertainty and changes in circumstances that may cause actual results to differ materially. The forward-looking statements in this news release assume, inter alia, that the conditions for completion of the Transaction, including regulatory and shareholder approvals, if necessary, will be met. Although Saint Jean believes that the expectations represented in such forward-looking statements are reasonable, there can be no assurance that these expectations will prove to be correct.